The Internet behemoths are turning over figures that make us all wish we were born around Silicon Valley in the 1950’s – to be educated enough to exploit the computer revolution in the 70’s and 80’s. But how do they stack up against each other now in 2014? 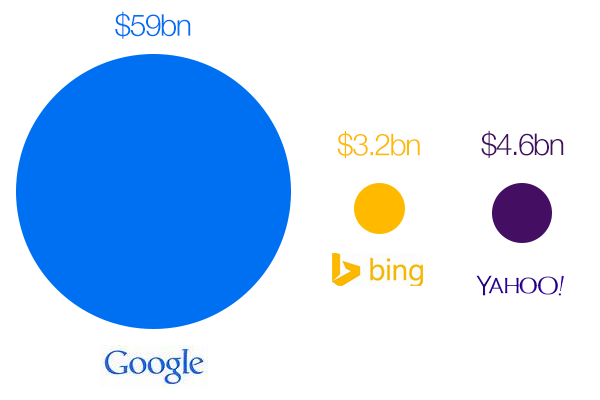 Below i’ve summarised the 2013 end of year financial statements, and other public documents, to compare how Google, Yahoo, and Bing are performing against each other. Let’s start off with how much money they’re bringing into the bank. Unsurprisingly, Google are turning over the most revenue out of the three major search engines. Yahoo and Bing are both impressively turning over 10-figure sums, although as we’ll later find out – only Yahoo and Google are currently making profit. We also need to bear in mind that we are to some extent comparing apples and oranges here – while Google is primarily a search engine, they do also own a plethora of companies including Motorola and YouTube, which are factored into their consolidated annual income report. According to their official 2013 annual earning releases and income statements, Google turned over $59,858,000,000, Microsoft’s online services division (primarily Bing) turned over $3,200,000,000, and Yahoo turned over $4,680,380,000. At the end of the day, it all comes down to the bottom line. 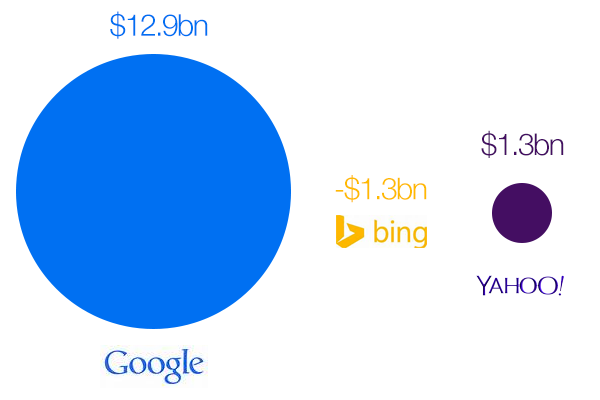 Out of the three search engines, only Google and Yahoo are turning a profit. Despite reducing their operating loss considerably over the past twelve months, Microsoft’s online services department do continue to report a loss of $1.3bn/year. Google reported net profits of $12,920,000,000 in 2013, and Yahoo’s net profit was $1,376,566,000. This is interesting, however, when compared with their market share in the United States (their primary market). In the latest ComScore US Search Engine Market Share Report, it was highlighted that Google’s current US market share sits at 67.3%. 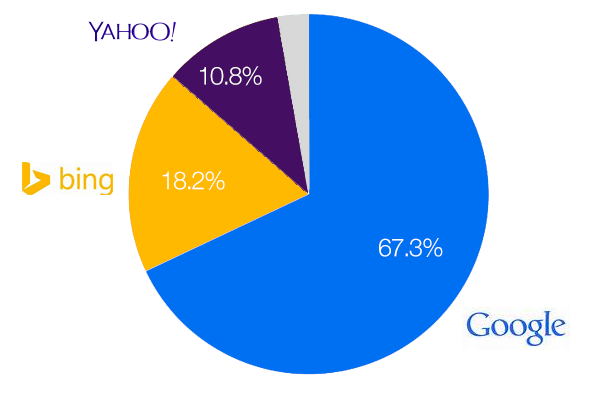 Despite their continued operating loss, Bing has managed to acquire 18.2% of the US market share – which appears to be taken from Yahoo, whose market share decreased from 11.2 to 10.8% between November 2013 and December 2013. Comparing the number of pages indexed by each of the major search engines (‘index size’) is not an exact science. The size of their indexes change daily, and none of the major search engines offer a real-time public record of their index size. However, based on the most recent data from WorldWideWebSize.com we can assume that Google has the largest index, followed by Yahoo, then Bing. To be honest, index size is a bit of an arbitrary metric, as it’s difficult to know whether a high or low number of indexed pages is better. Perhaps Google is indexing a lot more crap, whereas Yahoo has the best filter for only indexing good content. Alternatively, it’s possible that Google are indexing several billion extra great pieces of content that Yahoo are missing out on. Ultimately, these numbers are worth taking with a pinch of salt. While I couldn’t find the number of employees specifically working at Bing or in Microsoft’s online division, Microsoft do report in their Inside MicroSoft Report that they have 100,932 employees in total. This obviously includes staff working at Xbox, Microsoft Office, Surface, and all of their various businesses. What is perhaps a more like-for-like comparison is Google vs. Yahoo, as despite both owning various other businesses, they are both primarily search engines. 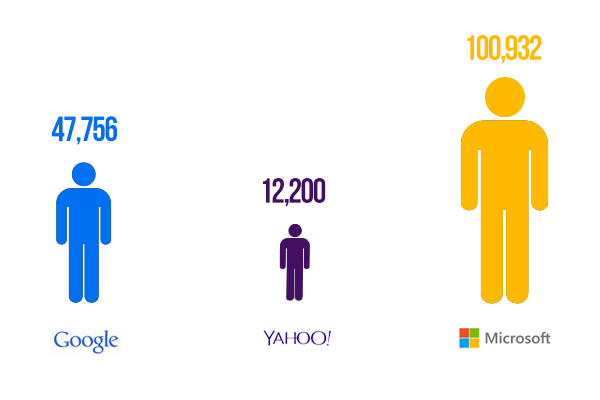 The most recent reports from Google suggest that as of end of 2013, Google had 47,756 employees, while Yahoo has 12,200. 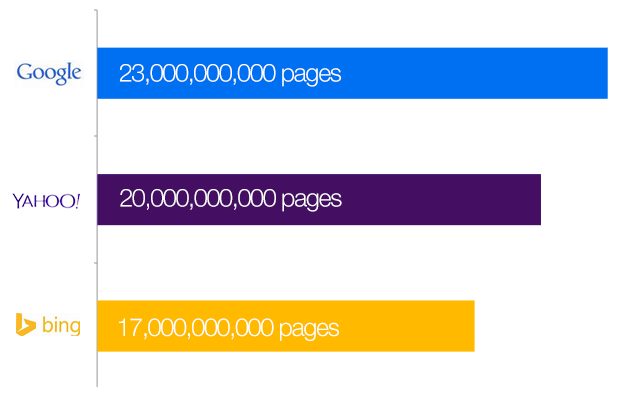 These numbers are of course in constant flux, but provide an insight into the scale of each of their businesses. Google currently have 6,795,393 shares issued at $536, giving them a market cap of $363.39 billion. This is slightly higher than Microsoft’s market cap, which despite having a lower share price of $40 per share, has 36,689,399 shares issued, giving them a market capitalisation of $335.35 billion. Finally, we have Yahoo with 28,940,000 shares issued at $36.38, giving them a market capitalisation of $36.69 billion. Each year, InterBrand release their infamous ‘Best Global Brands Report‘, which is a top line summary of InterBrand’s detailed valuation of the World’s best known brands. In 2013, Google was voted as the second most valuable brand in the World (worth $93,291,000,000), behind Apple. While Yahoo ranked quite low, their brand was still valued at $3,851,000,000. Bing, unfortunately didn’t make the ranks of the top 100 brands, but the parent company, Microsoft, was ranked as the fifth most valuable brand worth $59,546,000,000. 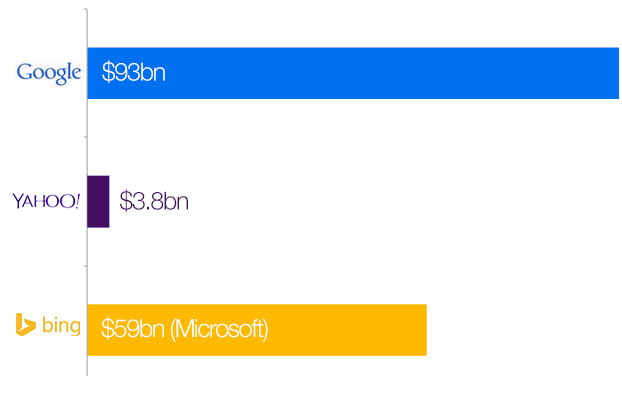 In the graph above, we’ve used Microsoft to illustrate the brand value of Bing. There weren’t too many surprises to be honest; Google are in the lead, Bing aren’t profitable, and Yahoo’s doing okay-ish. What I find particularly interesting is how aggressive Bing appear to be at the moment. They’re clearly investing a lot of money into their search engine, which appears to be translating into small increases in market share and their share value. While it seems like they’re getting closer to turning a profit, they’ve still got a long way to go before they can take on Google’s 67.3% market share.